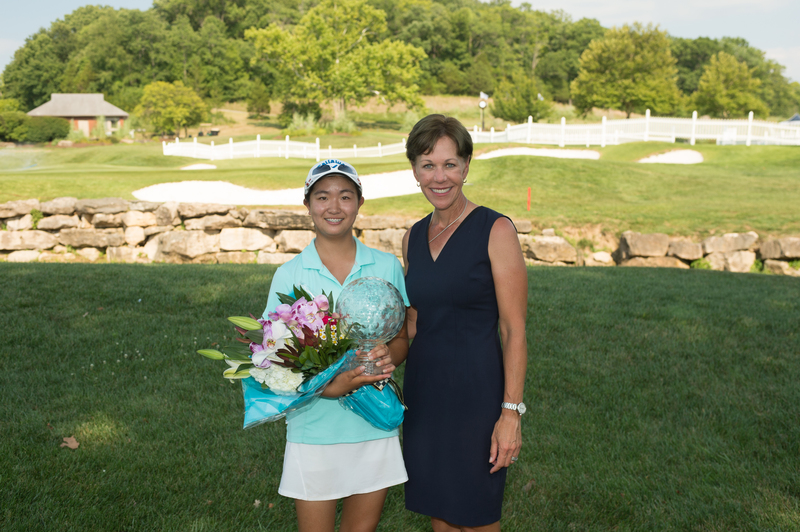 ALBANS, Missouri – During the third round of the Girls Junior PGA Championship, Rose Zhang gained control of the lead and never looked back. The 14-year-old claimed victory and tied another Championship record on Friday at the Country Club of St. Albans, Lewis and Clark Course. Zhang, of Irvine, California, closed the Championship with a 4-under 68 to reach 20-under 268, tying Kristen Gillman’s 2014 performance for lowest 72-hole total in this event’s 42-year history. In the process, she totaled one eagle, 22 birdies and four bogeys. Yealimi Noh, of Concord, California, finished runner-up at 274. With three birdies through her first six holes on Friday, Zhang was in position to run away with the Championship. However, a bogey at the par-4 9th trimmed her lead to three as she made the turn. Par golf ensued for Zhang early on the back nine, and a birdie by Noh on the par-5 14th cut the lead to two. No sweat for the Champion, as she responded with birdies on 15 and 16. A double-bogey suffered by Noh on the 16th pushed the difference to six. “I think I played well under pressure and allowed myself to be in this position,” said Zhang, who didn’t miss a fairway in the final round. Playing in her second Girls Junior PGA Championship, Noh improved from a T-21 last year. While the lead proved insurmountable, she played a steady final round and posted a 2-under 70. Defending Champion Lucy Li finished in a tie for third (276) after a 2-under 70. Joining Li on the leaderboard were Michaela Morard, who carded a final round 5-under 67, and Angelina Ye, who matched Li’s Friday total. The low score of the final round belonged to 2015 Champion, Elizabeth Wang. She jumped 18 spots into a tie for 11th after firing a 7-under 65. Zhang penned her name in the record book all week. In addition to matching the lowest 72-hole total, she tied the lowest second and third round scores, as well as set a new 54-hole scoring record. Not bad for a 14-year-old who has yet to enter high school.